Més grafè per a l’emmagatzematge d’hidrogen. Ara, arrugat. En diverses ocasions n’hem parlat. Des de que el passat 2010 el Premi Nobel de Física fos per Geim i Novoselov pels seus sobre el grafè, s’ha fet molta recerca al voltant d’aquest material bidimensional i ja en veiem algunes aplicacions a la vida quotidiana. Ara llegim un article a la RSC que investigadors del NEST, National Enterprise for nanoScience and nanoTechnolog (Itàlia), amb els seus càlculs teòrics computacionals publiquen que làmines de grafè arrugades podrien ésser una bona base per a l’emmagatzematge d’hidrogen (publicat a la J. Phys. Chem). Now, Valentina Tozzini and Vittorio Pellegrini of NEST, have used density functional theory and molecular dynamics simulations to show that distorted sheets of graphene – single layers of carbon atoms in a honeycomb configuration – might provide another approach. The team’s calculations suggest that if layers of graphene are compressed laterally to form corrugations, hydrogen would find it energetically favourable to chemically bind to the convex tops of the ridges. 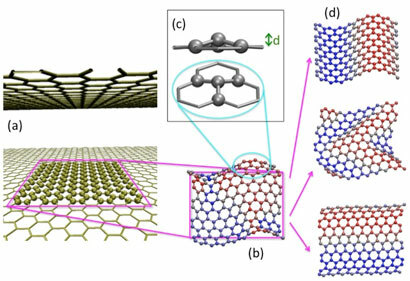 In flat sheets of graphene, carbon’s electronic orbitals are sp2 hybridised. If the sheet is buckled, the orbitals at the convex surfaces assume a geometry closer to sp3 hybridisation – which hydrogen finds attractive.